In the fourth quarter of 2018, over 310 respondents participated in ASG’s survey regarding the mood and intentions of the current business aviation market. Tension between the US and China regarding the trade conflict has resulted in the Asia-Pacific region’s — particularly Greater China’s — respondents to maintain their economic pessimism in 2018 Q4. During the fourth quarter of 2018, the US pushed ahead with tariffs on imports from China. Though there are signs of relief between the two largest economies and subsequent trade talks, there are now increased concerns over China’s economic outlook in 2019. In Q4, 38% of respondents believed that the economy passed its low point and will improve; 18% lower than 2017 Q4, which marked the highest point of optimism with 56% of respondents. Optimism has gradually declined since then. The number of respondents who believe the current economy is at its low point and will get better is 29%; 2% higher than the previous quarter. 33% of respondents believed that the economy hasn’t reached its low point and will continue to worsen; the highest level of pessimism since 2017 Q1. 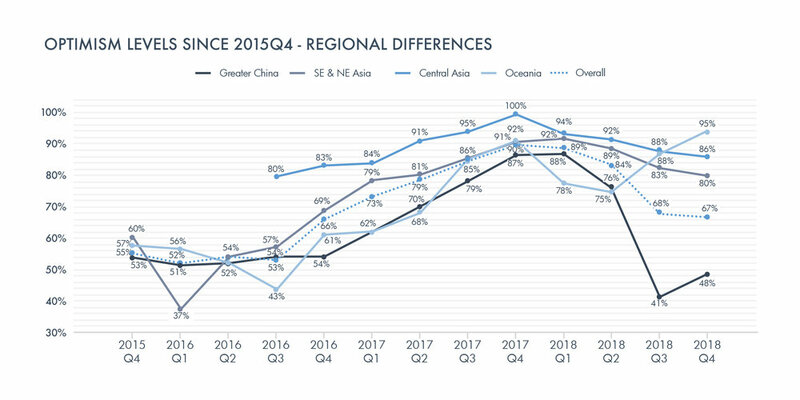 The optimism level for Greater China (Mainland, Hong Kong, Macau and Taiwan) is the main contributor to the overall low optimistic levels for Q4, as concerns over the future economy continue to increase. In general, respondents who believed that the current economic situation has passed its low point or is at its low point can be described as optimistic. This quarter, 67% of respondents believed that our economy will improve in the future; a decreasing trend since 2017 Q4 and the lowest point since 2016 Q1.